Home / Context Clues / And now on the Importance of Context Clues! And now on the Importance of Context Clues! I am a huge fan of teaching children context clues to navigate text. Context clues are hints of information that help us figure out the meaning of unfamiliar words. Context clues are the words and sentences that surround a word and help explain the word’s meaning. Context clues are hugely important because their comprehension and effective usage leads to academic success. They can increase the child’s vocabulary, reading comprehension, and make children better readers. I am always looking for more materials to teach children how to interpret context clues which is why I was very excited when i got the opportunity to review Carrie’s of Carrie’s Speech Corner: “Out of This World! Context Clues“. 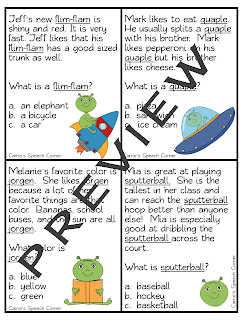 This alien themed 21 page packet was created by Carrie to help students learn to use context clues by figuring out the meaning of nonsense words. The premise is super cute and engaging. Student get to be the astronaut exploring a new planet who encounters aliens who speak a language similar to English, but with some very different words. So her first set entitled “Context Clues Multiple Choice Cards” has 20 stories in color (which are also repeated in black and white) which have nonsense-words from the “alien language.” Based on the context of the story students need to figure out the meaning of the alien word. 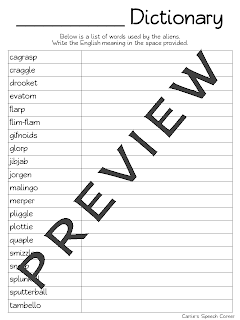 The second activity is called “Out of this World Dictionary” in which students get to create a dictionary using the alien words they’ve learned from the short stories. an answer key is provided of course. 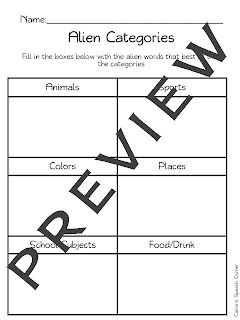 The third activity involves matching English words to alien words by drawing a line, while the fourth activity is focused on making silly sentences with the alien words. There are two levels to this activity the first involving only one word while the second 2 words. Finally, the last activity is super fun. Students get to figure out their alien name by using a cipher. I love the fact that this packet is heavily focused on problem solving and critical thinking skills because so many of our students can benefit from an extra dose of that. 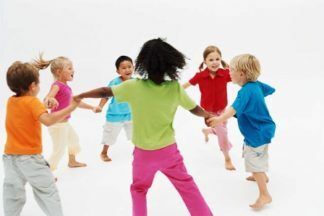 Depending on the students abilities and cognitive levels the packet might be applicable with a wide variety of age levels ranging from early elementary through middle school. You can find this packet in Carrie’s TPT Store HERE for a mere $2.50. But that’s not all Carrie is doing a review of my Language Difference vs. Language Disorder Packet on her blog so we decided to do a giveaway of our respective products. She is doing a giveaway of my product I am doing a giveaway of hers, so enter my Rafflecopter giveaway below to win and don’t forget to head to Carrie’s Blog for an opportunity to maximize your chances to win both. I couldn’t agree more, which is why I use http://wordsinasentence.com to grow my vocabulary. Granted, the site is geared toward those in high school and college.